I’m still working on the SWARM art project with friends. See a SWARM video I produced and some blog updates. about it. I’m starting a new job as a residential solar power sales consultant at Premier Power. 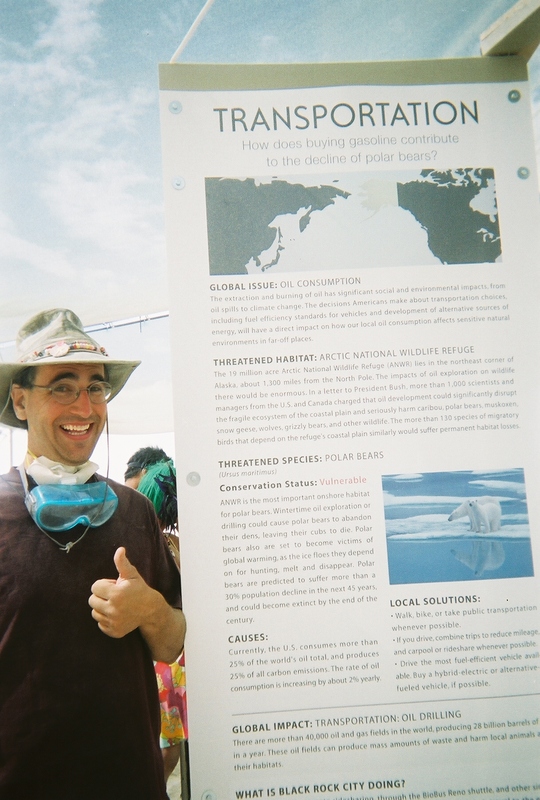 My good friend Barry introduced me to the position and I’m terribly excited at the prospect making a good income at saving the world. I had worked at Valley Yellow Pages over the summer specifically so I could get my sales chops. We’ll see how it goes! Charlotte and I are doing well together. We’re still in our tiny 24th st apartment… with the new job looming, I’ve thought and said aloud many times, “I can’t wait until I have some money”. I haven’t often thought of how money could improve my life but now I am. Again, we’ll see how it goes. 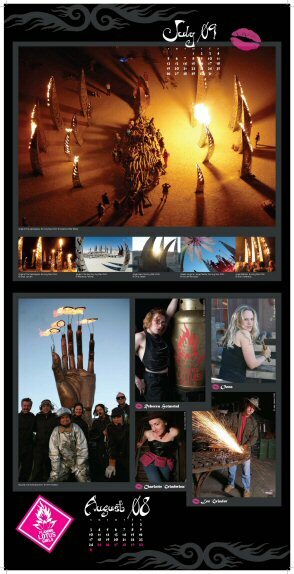 I helped produce and sell $4,000 of Flaming Lotus Girls calendars for the Christmas season. That makes me pretty happy and proud. Went to a couple baby-shower like events recently… Pouneh from FLG and Michelle H. It looks like everybody is getting bulbous bellies these days. I’ve been helping Tad create the ultimate workbench. I’ve gone over to his house a couple times to cut wood and move things etc… he’s got a LOT of electronics gear in his house and he uses it! Maybe it’ll give you some glimpse to know that he has a $400 electric bill each month, and he lives on his own! Helping him has been fun. I’ll try to post pictures when it’s done. It looks like it’ll be 3 shelves, each capable of holding 600 lbs of gear (and yes, he’ll use it), the main table level is about 4′ x 8′, with the back being occupied by 2′ deep gear like oscilloscopes and the like. For Christmas, my folks got me a Tom Tom (which will be good for my new job!) and are getting me tickets to Burning Man. I like very much that they have enough acceptance of “those crazy hippies in the desert” that they’d do that for me. I suppose that’s the most of it. You can find out more about what I’m thinking by reading the rest of my blog. I see that this blog thing is getting quite extensive. I’ve made over 1,200 posts to it since I started it 5 years ago in 2002. I make a point of only posting things that are important to me. I welcome you to see the New Year card I sent to many people this year. It’s really quite pleasant. If the card isn’t available anymore, here’s a local version. 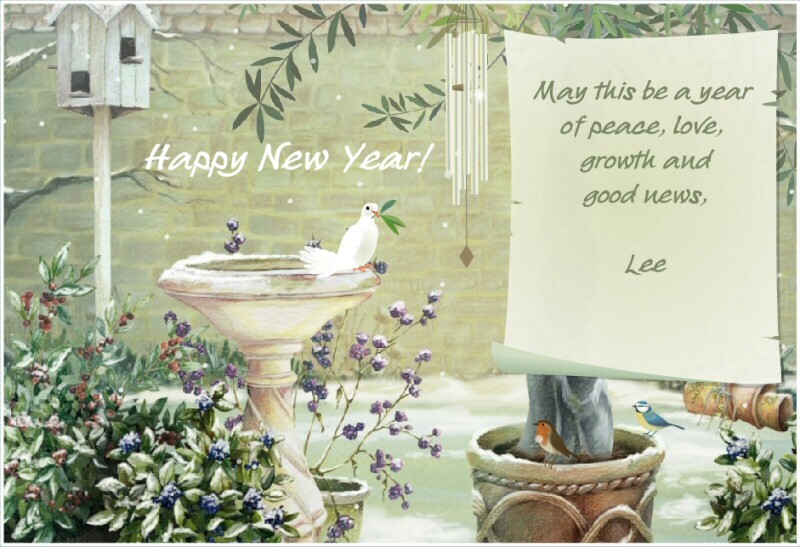 Originally, the interactive card ended with “Happy New Year” and “May this be a year of peace, love, growth and good news”. I’m now a certified forklift operator, whatever that means. 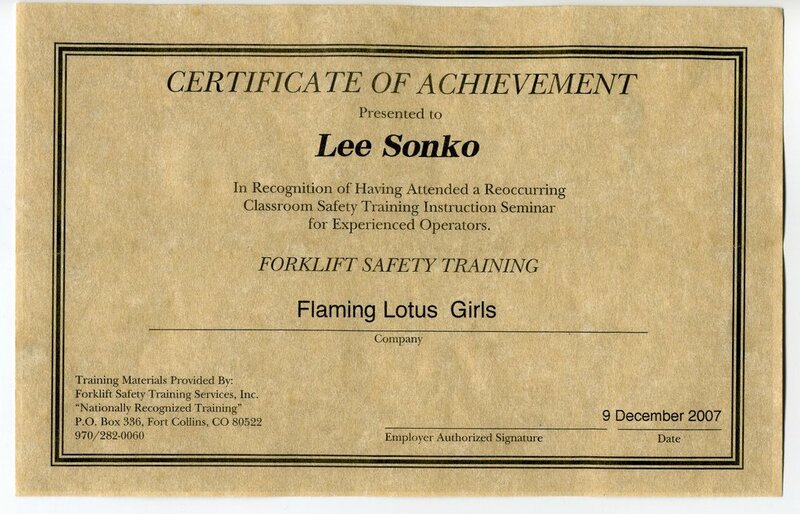 Flaming Lotus Girls organized a certification class with this OSHA certified guy. This was partially in response to Todd Blair, a member of SRL, being severely injured after the conclusion of Robodock; though a forklift wasn’t specifically to blame for his injury, I think it got us all thinking about safety in general. And it’s not as if this certification will actually help keep anyone safe. In order to pass, you had to score a 60% on a True/False quiz and drive the forklift around the yard without killing anyone. It’s hard to fail. The next time you see a certified forklift driver, know that they might have only scored a 61% on a True/False test. The 30 minute video told us not to let people ride around on the forks, not to lift things that exceed the rated capacity of the forklift, not to lift things that are too big, not to drive around like a crazy person with the forks at head-height, to honk the horn before you go backwards, not to service the forklift unless you are “authorized”, and to never check a fuel tank with a lighter. The hands-on instruction was fine. As has been said before, the way to get good with the forklift is to practice. I stuck around for a while watching the beginners and he helped them figure it out. Though no one I saw had any real trouble. It’s just a matter of familiarizing ones-self with the controls. the $100 certification is good for 1 year. In the workplace, it will help protect employers from lawsuits if something unfortunate happens. (Note that FLG is not an employer). The instructor mentioned that he usually gets called out when OSHA came by for a workplace inspection of a company and the company called him so he could do an emergency certification class. He’d pre-date the certificates. Nice. At least everyone found out that our forklift has a horn; it’s on the forward/reverse shifter.